I've had this gorgeous piece of Black Walnut for almost 10 years. 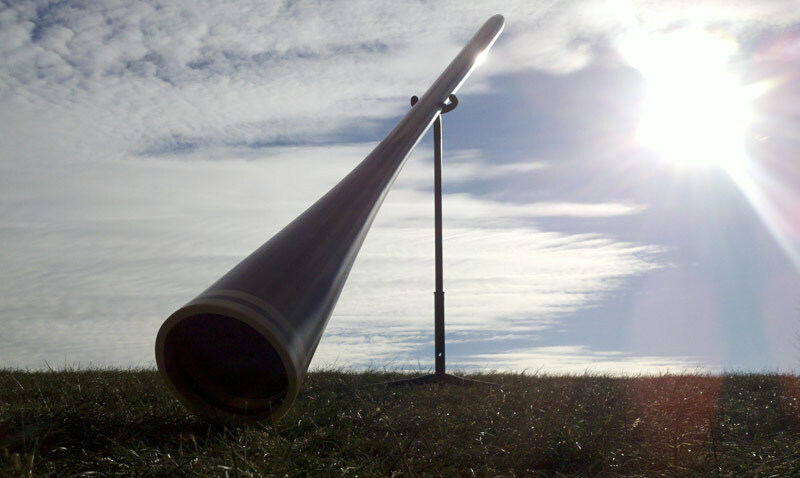 It came from the same tree that provided the logs destined to become some of my favorite instruments. I have one in my personal collection and several are in the grasp of old friends. The massive tree is still living, even after gifting me a half-dozen very large logs. This final piece was only 4 feet long and around 14 inches in diameter. I took a few slices off to make some end tables and then stored the rest. 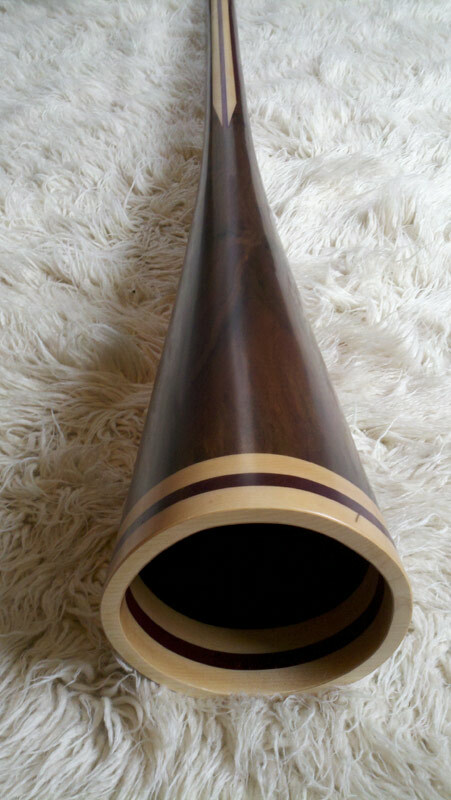 I wanted to make something special with this last piece and the didgeridoo above is the result. 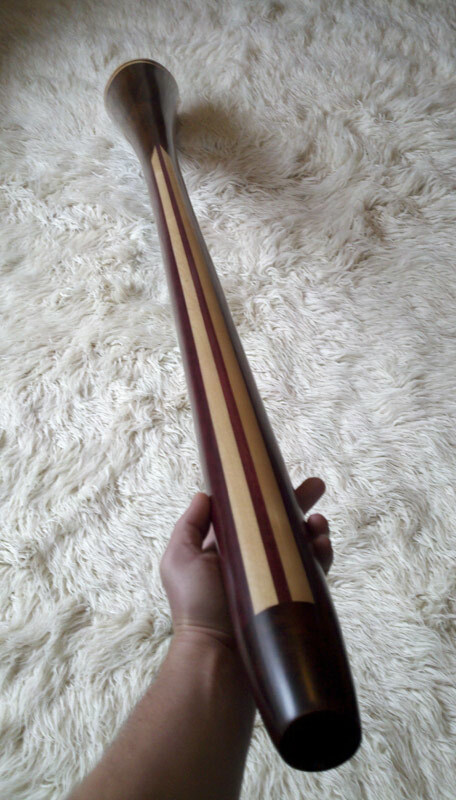 The neck of this instrument is a lamination of Purpleheart and Hardrock Maple. The bell is adorned with the same woods. The neck extension is fitted to the bell with a striking "V" shaped seam. This adds tremendous strength to the joint and is also pretty swell to look at. 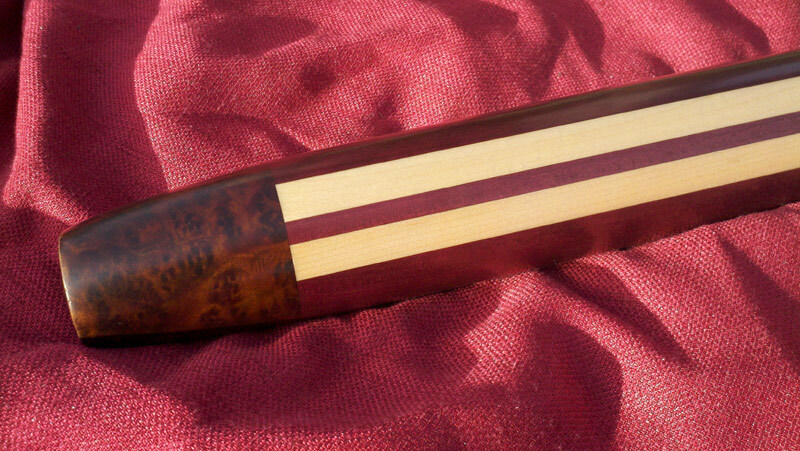 The 4 1/2 foot extension has a textured and tapered bore. It wasn't bored through - Rather carved out just like my standard sticks. 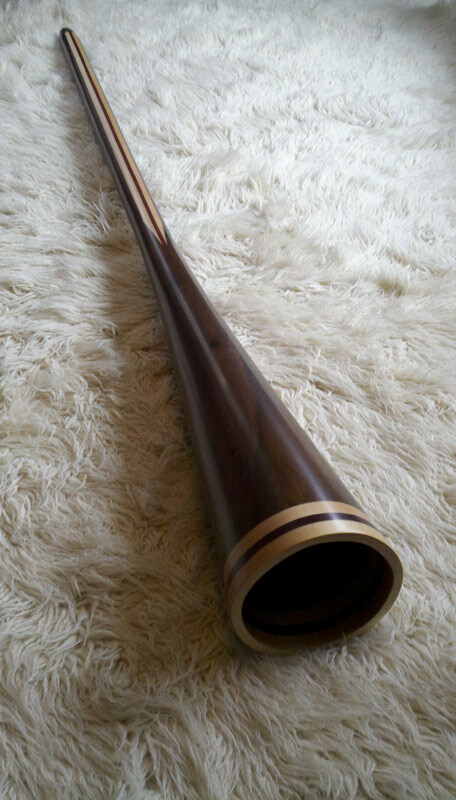 This Didgeridoo is finished in a flawless, satin sheen. 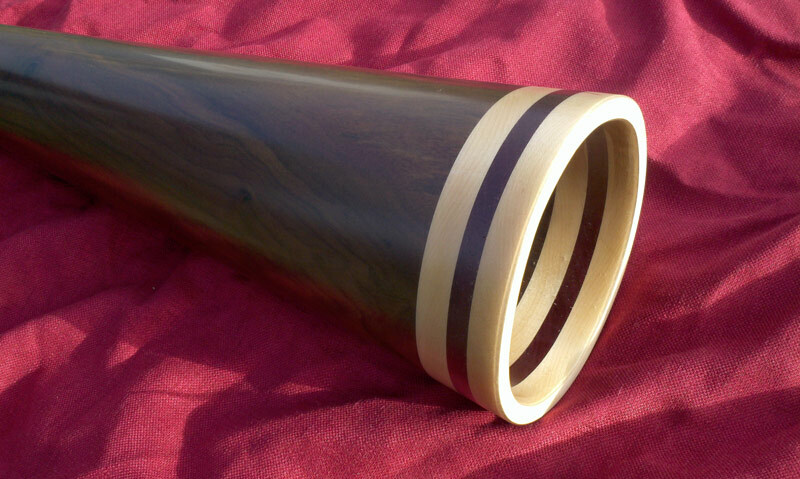 The mouthpiece is carved from a highly figured chunk of aromatic, Camphor Burl. 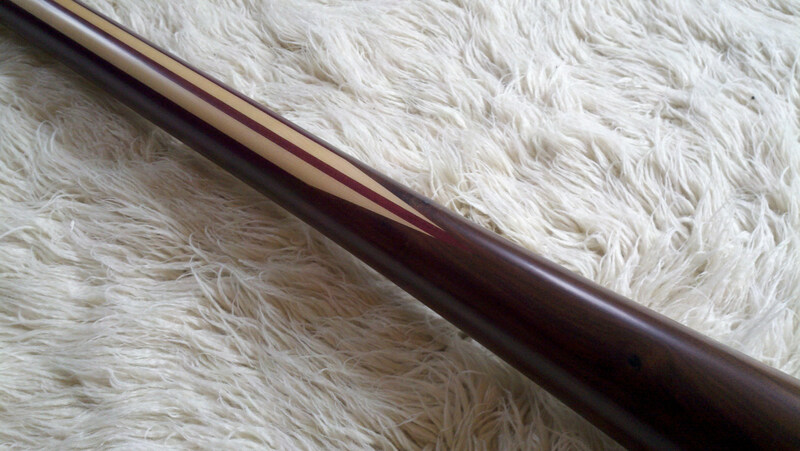 This instruments inner profile makes for a fast, high octane player. This is a shape I know well and tend to utilize on my sticks pitched in E. This one however, is perfectly pitched at a subterranean B. This is a do-it-all didj. Five toots are accessible and they are effortless to glide between. The volume of this stick is easily modulated. Play her whisper soft, or crank the beast up to 11. All while allowing ease of articulation and subtle expression. This stick has excellent back-pressure and for such a low pitch, requires minimal air to fire up. Want to play ambient, spaced-out trance? No prob. Blazingly fast, staccato tongue work peppered with bounce breath? Yepper. Trumpet infused, groove based dub-step? Sure thing. This one does it all. And once again - Look at it!